Welcome to the Beginner’s App Store Optimization (ASO) Course, there are 8 lessons in total in our ASO Course. Throughout the lessons, we will cover the basics of ASO and teach you how to maximize your ASO potential. This course is broken down into eight individual lessons on our ASO Academy site. We have carefully crafted each lesson to be concise and provide you with actionable steps that you can use immediately. In the first lesson, we will define App Store Optimization, explain why it is important, and illustrate a great case study demonstrating the value of ASO. There are numerous ASO definitions on the internet, many of them varying in the influencing factors for ASO. In this ASO Academy course, we will use Sensor Tower's definition of ASO throughout the lessons to simplify the definition for our readers. App Store Optimization (ASO) is the process of improving the characteristics of an application that is designed for mobile platforms such as iOS and Android, with the goal of creating better search visibility and getting more downloads on app stores such as the Apple App Store and Google Play. The characteristics that are optimized include: app name, keywords, screenshots, demo video, icon and description. It's important to emphasize a couple parts in our definition for clarification and to understand the importance of certain aspects. First, it is a process. The App Stores change on a daily basis and you need to regularly monitor your keyword rankings and category rankings. The conditions within the App Stores are constantly evolving and doing ASO just once will negatively impact the success of your app. It is a long-term marketing strategy that must be continuously tracked over the lifetime of an app. Second, there is a misconception that ASO is only about keywords. Keyword rankings are a large part of ASO, however, your app needs to be visually appealing to a potential user so they download it after finding it through a keyword search. This means having compelling screenshots, a beautiful app icon, and other elements that will help convince a person to choose your app over your competitors. According to U.S. App Store data in 2017, 65% of apps are discovered through app store search. Based on this data, it is essential for your app to rank for keywords that people are searching for when they want to download an app like yours. A 2018 Sensor Tower report upheld the App Store data results in a 12-month analysis of App Store download data from May 2017 to April 2018. 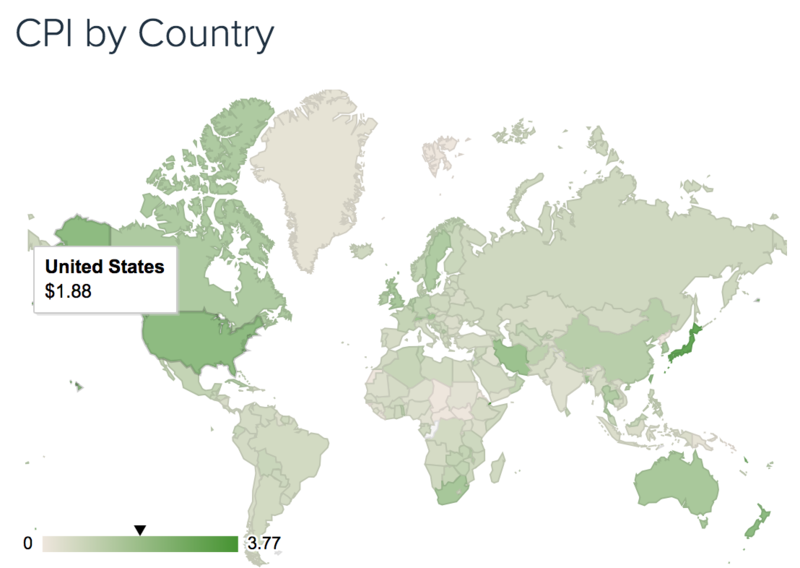 You can read our blog post about it here if you'd like to learn more about App Store download data. 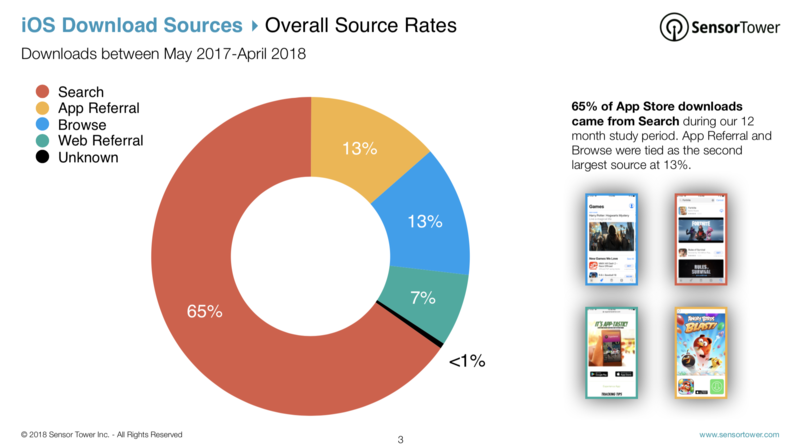 Compared to paid advertising, which Chartboost reports to be an average of $1.88 per iOS app installation in the United States, ASO is one of the most cost-effective ways of getting downloads. With paid advertising, you can advertise on an advertising network with a Cost Per Install (CPI) model and pay a certain amount of money every time someone installs your app from the advertisement. This amount is determined by a bidding system where App Publishers bid on ad space within other apps. At an average of $1.88 per installation, you will need a substantial advertising budget to benefit from paid advertising. Comparatively, investing in ASO can potentially drive thousands of downloads a day for the relatively low cost of ASO data and a few hours of research every month. It is one of the most cost-effective ways of driving downloads from the app store. However, as important as ASO is to the overall marketing strategy of an app, you must also remember that it is not a magic bullet. It is simply one piece of a marketing plan that can include paid advertising, content marketing, and more. Since ASO is usually the lowest cost strategy, it is generally the best place to start. Even publishers with large marketing budgets can benefit from proper ASO by expanding their organic downloads and reducing their budget for paid advertising. In practice, ASO can drive organic growth when executed well. Tapps Games provides a great case study on how ASO can benefit you in increasing your number of downloads and improving the success of your app. Tapps Games was originally an enterprise Business app developer, however, they decided to move into the Games market with no experience in the gaming industry. After a difficult transition, Tapps Games was able to hit over 10 million downloads in the gaming industry in under two years. Marketing Director Felipe Watanabe attributes a large part of their marketing success to ASO. If you'd like to learn more about Tapps Games and their successful journey, check out our blog post! Hopefully, this first lesson has helped you understand what ASO is and why it is a key component in marketing for your app. In the next lesson, we will explain the differences between how the Apple App Store and Google Play Store determine which keywords are associated with your app.